What exactly is scrap metal? Metal is present in most objects we see around us - food storage boxes, houses, vehicles, accessories, computers, mobile phones - a component that's found in various things, big or small. When these objects are old and ready to be discarded or demolished, the metal that remains becomes scrap metal, which can be melted and recycled to produce new useful products for consumers. Many consumers, individuals or business organisations, actively participate in recycling discarded metals by bringing large amounts of scrap metal to the scrap yards which also rewards them with money in return. Lots of metal like aluminium siding, steel beams and copper pipes go into constructing houses and other buildings. When old buildings are demolished, the leftover metal materials can be used for new construction. 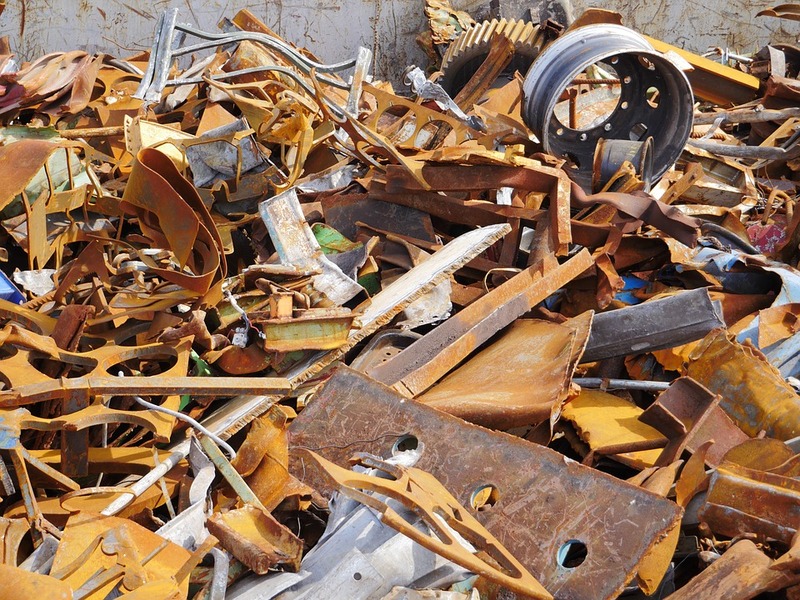 Factories, manufacturers and other mechanic shops discard heaps of metal waste. After metal sheets are cut out, the remaining material becomes scrap which can be recycled for new products. Large number of old/damaged automobiles and their parts are discarded, from which the metal parts can be broken down, recycled and reused as metal scraps. Our houses are loaded with metal scraps right from household appliances to steel cutlery, cans, can openers, aluminium foil, electronics like computers and televisions and furnishings. At scrapyards, these metals are recycled to make other goods. If you plan on recycling metals, the simplest way is to gather your old household items and bring them to scrapyard to be recycled and reused. While buying and selling scrap material, have you ever wondered “What is the difference between ferrous and non-ferrous materials?” If you have, read on to learn more. Ferrous metals like mild steel, stainless steel, cast iron, wrought iron and carbon steel contain irons which are used for their strength and durability. They are used in making industrial containers, construction of buildings, pipes, automobiles and rails for railroads and hardware tools like knives, used at home. Most ferrous metals except for wrought iron and stainless steel are prone to rusting because of the use of carbon to create them. They also have magnetic properties and are used in creating electrical appliances like refrigerators and large motors. The most recycled materials in the world are indeed ferrous metals. Non-ferrous metals include tin, lead, copper, brass, aluminium and zinc. These metals are strong, more malleable and light weight than ferrous metals and are used largely in the canning industry and aircrafts. Since they don’t contain iron, they resist rusting and are used in water pipes, road signs, gutters and roofing. Their non-magnetic factor works in electrical wiring and small electronics. Also, aluminium is the third most recycled material while other non-ferrous metals like brass, lead and copper are scarce. Those wanting to sell the metal must know that ferrous metals are found in good number; hence the prices tend to be lower than non-ferrous metals with minor rises or drops in the pricing. Other than aluminium, prices of non-ferrous metals can highly fluctuate. The act of recycling metals is prevalent since times unknown and today, with widespread technology, managing scrap metals, and its business has become easier than ever. Technology provides us with many platforms to efficiently manage waste by connecting buyers with sellers. Numerous websites with verified scrap listings connect people to buy and sell scrap online as per their requirements and price ranges. You will come across several deals and you can choose which suits you best. Every person today is using a handheld device such as a smartphone or tablet, hence, the online business of waste management is integrated for use on-the-go. Many apps or at least mobile sites can be found that aid in keeping you connected with the websites and let you filter your searches based on your requirements, price range and location as well as initiate transactions which make up the larger part of e-commerce. Technology today has enabled us to communicate in different ways from anywhere and everywhere. It is so much easier to now exchange photos and videos and asks to have a look at the scrap you are planning to buy. Communicating with the help of technology on verified platforms helps buyers and sellers in staying away from making any possible fraudulent transactions. You can create an online inventory where you can manage your scrap to suit your customers’ requirements. The filters and data management options available help you organize your scrap inventory systematically as well as make suitable purchases. The fashion space keeps introducing new designs and existing metals are used to make jewellery pieces according to latest trends. While some metals are referred to as scrap when they are worn and outdated, it is quite easy to recycle them to get new designs. Copper wire, mixed copper and copper tubing can be recycled to produce new jewellery pieces. Bronze is a common scrap metal found in a variety of industries that can be recycled once it is worn out. The use of bronze fixtures has increased tremendously and it is being used on a large scale in the jewellery industry too to create fashionable pieces at lower costs. The stainless steel industry knows how important and beneficial it is for our environment to recycle the metal. The metal is found in various items we use on a daily basis and can be recycled to be used as jewellery. Often found in electronic waste, coins, and old jewellery, silver is commonly recycled to get new jewellery pieces. It is a durable and highly valued metal in the jewellery industry which can be recycled to produce new pieces from time to time. Known as the most valued metal, gold is often recycled to keep up with its high demand in the jewelry industry. Disclaimer: This article(s) has been prepared solely for information purposes, using publicly-accessible sources that are believed to be accurate and reliable at the time of publishing. LUCKY GROUP accepts no liability whatsoever for any loss or damage resulting from the use of information, images or opinions expressed in the report. LUCKY GROUP does not give warranty of any kind regarding the completeness, accuracy, and reliability of the information included in the article(s). If you are new to this world of scrap metal recycling, you are surely prone to get confused between steel, iron, tin and aluminium. This unfamiliarity and inability to identify these metals can be quite overwhelming. But there is nothing for you to worry about. This guide will assist you in identifying the various kinds of metals out there. This is by far the simplest way to classify and identify the metal. Getting an ordinary magnet is all you need and in case the metal contains iron, it would get attracted to magnet. These are ferrous metals. Scrap iron will pass this test. However, scrap brass or aluminium will not be responding to magnet as they are non-ferrous in nature. Colour of the metal can help you in identifying the chemical makeup of the metal. In case the metal is red in colour, it could be copper or even red brass. Similarly, golden coloured metal could be brass. You can also classify metals on the basis of their weight. For example, a lightweight metal could me aluminium and likewise, lead and iron metals would be heavy in weight. If the metals are soft, they could be copper; however, metals like steel and iron are quite hard and are break resistant. The metal which is quite easy to bend is aluminium. If you are still unable to classify the metal, it would be best to seek help from professionals. They can assist you in classifying the metals through their scientific tests.